"Hi Andrew The two staffs you provided are excellent and exactly what we wanted and will be used throughout Series 4 of Merlin. You responded to the brief promptly and accurately. I greatly appreciated your enthusiasm and creativiity for this project. 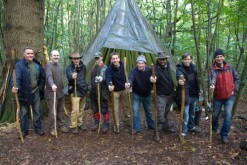 A fantastic opportunity to spend time in tranquil woodland in the heart of South East Kent making your own unique Walking Staff or Tracking Stave that you will value and use for a life time. You can choose to personalise your Staff with markings or carvings and could EVEN make your own Tracking Stick to use in the field on our Footsteps TRACKING Course. Sitting around a roaring camp fire you will design and create your own personalised Staff with the guidance of an experienced instructor. During this one day practical Staff Making event you WILL be... Given the tools and advice of how to make the most of your PERSONALISED design. Choose from various seasoned wood, Hazel, Ash or Maple. Decide on the length, the width and design for your UNIQUE Staff. Shown how to STRIP and SHAPE the seasoned wood correctly. Be given clear bushcraft instruction on SAFE knife and tool use. Provided with all the EQUIPMENT and materials needed, seasoned wood, tools, vanish and wax. Branding designs or markings of your choice on your newly made Staff with HOT branding irons Or you may choose to add your own personal CARVING. Inserting a button compass to the top of your newly made Stave if you wish. Given a choice of finishes for your Walking Staff or Tracking Stave with either varnish or bees wax. Choosing whether to add a rubber base to the bottom of your Staff. Course timing 10.30 to 3pm. Please arrive 10 minutes prior to course start time. Or pay by cheque by completing booking form (click on BOOKING FORM icon below) and send cheque to address on booking form. There are 7 reviews for Staff Making Day.